Florida Derby favorite Upstart makes his final stop on the Kentucky Derby 2015 trail at Gulfstream Park on Saturday, March 28. The Fountain of Youth Stakes did not look good from a visual standpoint, and Florida Derby favorites #4 Itsaknockout (2-1) and #9 Upstart (8-5) both exit that less than stellar heat. The former has upside with only three starts under his belt and the latter is a gem of consistency. #7 MATERIALITY (7-2) is the stranger danger for Todd Pletcher. He has the same profile as 2014 Florida Derby winner Constitution and could easily make it three straight under Johnny V. He’s my top selection. #1 Ami’s Flatter (8-1) was my longshot underneath key in the G2 Tampa Bay Derby on March 7th and he did not disappoint with a solid place finish at 13.50-1. Leading rider Javier Castellano hops aboard and he could spice up the exotics again. Dale Romans just failed with Shackleford in the 2011 Florida Derby at almost 69-1 and he saddles another longshot this year, #3 Indianaughty (20-1). The son of Indian Charlie is bred for dirt and might move up 3rd off the shelf. The Florida Derby field is completed by outsiders #2 Jack Tripp (20-1), #5 Quimet (20-1), #6 My Point Exactly (30-1), and #8 Dekabrist (30-1). G3 Spiral (92 BSF): Dubai Sky was always traveling well from the outside and comfortably finished in front of Conquest Typhoon and Firespike. G3 Sunland Derby (97 BSF): Firing Line could not have had an easier final Derby prep, winning by the length of the grandstand under jockey Gary Stevens. Where’s the Moon was more than fourteen lengths back in 2nd and Pain and Misery landed the show. Check out my written analysis of the 2015 Louisiana Derby at HorseRacingNation.com! Latest Published Workout: 4f in :48.92 (7/30) at Palm Beach Downs on March 21. Last Start: 1st in G2 Tampa Bay Derby on March 7. Comments: He will have his final Derby prep in the Blue Grass Stakes at Keeneland on Saturday, April 4. Latest Published Workout: 6f in 1:12 (2/18) at Santa Anita on March 21. Last Start: 1st in G2 San Felipe on March 7. Comments: After back-to-back grueling efforts, he got a much needed easy wire job win in the San Felipe. The SA Derby on April 4 is next. Latest Published Workout: 5f in 1:02.47 (19/30) at Gulfstream on March 22. Last Start: 1st in G2 Risen Star. Comments: He drew the outside post in the G2 LA Derby at Fair Grounds on March 28. Last Start: 1st in the G2 Rebel Stakes. Comments: Controlled the pace in all three of his graded wins and will return to Oaklawn for his final Derby prep in the Arkansas Derby. Latest Published Workout: 5f bullet in :59.90 (1/23) at Belmont (dirt training) on March 22. Last Start: 1st in G3 Gotham Stakes on March 7. Comments: He added a new closing weapon to his arsenal in the Gotham Stakes. The Wood Memorial is his final Derby prep. Latest Published Workout: 5f in :59.55 (4/24) at Palm Meadows on March 21. Last Start: Disqualified from 1st and placed 2nd in G2 Fountain of Youth. Comments: Crossed the line first in the FOY but did not look like the sharp Holy Bull winner. He is the Florida Derby favorite. Latest Published Workout: 5f bullet in :59.85 (1/18) at Palm Meadows on March 20. Last Start: Fading 4th in G2 Fountain of Youth. Comments: He returns to his favorite track to compete in the Wood Memorial. Latest Published Workout: 4f bullet in :48.40 (1/30) at Palm Beach Downs on March 21. Last Start: 2nd in G2 Swale. Comments: A solid place finish in his Swale return should set him up nicely for the Wood Memorial. Last Start: 1st in G3 Sunland Derby on March 22. Comments: After two grueling defeats to Dortmund, he cruised to an effortless tally in New Mexico and has wrapped up his Derby prep campaign. Latest Published Workout: 6f bullet in 1:11 (1/8) at San Luis Rey on March 21. Last Start: 2nd in G2 San Felipe on March 7. 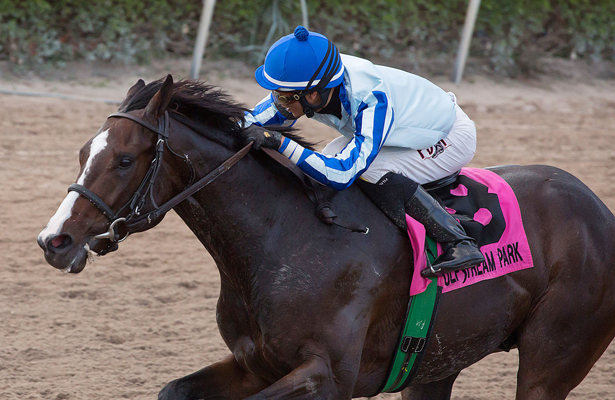 Comments: Rapidly improving colt earned important Derby points in the San Felipe. He is reportedly training well for the Santa Anita Derby. Trainer: Todd Pletcher – Owner: Black Rock Thoroughbreds, LLC. Latest Published Workout: 5f in 1:01.76 (7/8) at Palm Beach Downs on March 21. Last Start: 1st in G3 Withers at Aqueduct on Feb 7. Comments: Skipped the Gotham and goes next in the Wood Memorial. All-weather specialists take center stage on the Kentucky Derby 2015 trail in Saturday’s Grade 3 Spiral Stakes at Turfway Park. Royal Son went all the way in the local prep for the Spiral and looks like the target from the rail. 1-3 El Camino Real Derby finishers Metaboss and Conquest Typhoon square off again on a different synthetic surface and both merit respect. Imperia has scratched from the Spiral Stakes for trainer Kiaran McLaughlin. Check out my HRN written analysis of the 2015 Spiral Stakes! On Sunday, Firing Line gets away from Dortmund and looms a strong favorite in the Grade 3 Sunland Derby. G2 Rebel (100 BSF): American Pharoah began his sophomore season with a stylish wire job over a wet track. Bob Baffert absolutely owns the Derby preps at Oaklawn and his juvenile champion is expected to return to Hot Springs for the Arkansas Derby. Comments: He is expected to have his final Derby prep in the Blue Grass Stakes at Keeneland on Saturday, April 4. Comments: After back-to-back grueling efforts, he got a much needed easy wire job win in the San Felipe. The SA Derby is next. Latest Published Workout: 5f in 1:02.83 (9/18) at Gullfstream on March 14. Comments: Lecomte-Risen Star will probably return to Fair Grounds for the G2 LA Derby on March 28. Comments: The former early-pressing type added a new closing weapon to his arsenal in the Gotham Stakes. The Wood Memorial is next. Latest Published Workout: 6f in 1:13.40 (2/4) at Palm Meadows on March 13. Comments: Crossed the line first in the FOY but did not look like the sharp Holy Bull winner. The Florida Derby is his next engagement. Comments: He competes next in Wood Memorial. Comments: A solid place finish in his Swale return should set him up nicely for an upcoming two turn Derby prep, possibly the Wood Memorial. Latest Published Workout: 5f in :59.80 (8/50) at Santa Anita on March 15. Last Start: 2nd in G3 Robert Lewis Stakes on Feb 7. Comments: Gave undefeated Dortmund a big scare in the Los Al Futurity and Robert Lewis Stakes. He’s the strong choice in the G3 Sunland Derby on March 22. Comments: Rapidly improving colt earned important Derby points in the San Felipe. Up next is the Santa Anita Derby. Latest Published Workout: 5f in 1:01.03 (1/4) at Palm Beach Downs on March 14. Last Start: 1st in G3 Withers. Two-year-old champion American Pharoah begins his march towards Kentucky Derby 2015 in Saturday’s Grade 2 Rebel Stakes at Oaklawn Park. 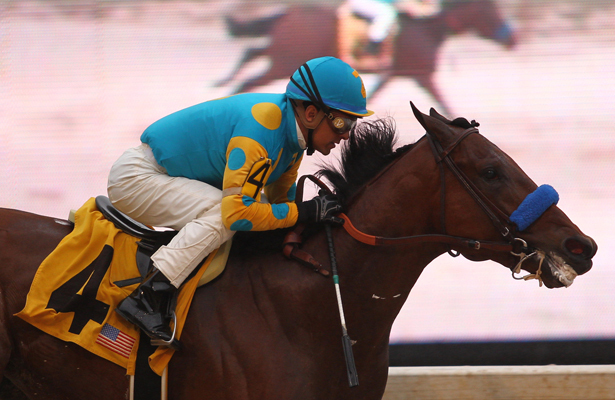 American Pharoah looms a short priced wire-to-wire winner on Saturday. Bob Baffert owns the Rebel Stakes and his promising colt is training lights out for his first start in more than five months. G2 San Felipe (104 BSF): Dortmund needed an easy race and got it here. He went straight to the front and comfortably went all the way to remain undefeated. The improving Prospect Park finished 2nd and turf specialist Bolo ended up a respectable 3rd. G2 Tampa Bay Derby (98 BSF): Carpe Diem remains my top ranked Derby contender after a facile win to begin his sophomore campaign in Florida. Queen’s Plate favorite Ami’s Flatter added lasix and blinkers and finished a decent 2nd. Diving Rod was 3rd and Ocean Knight finished up the track in a very disappointing effort. Souper Colossal spiked a temperature and scratched. He is feeling better now but is off the Derby trail. G3 Gotham (89 BSF): El Kabeir showed a new rallying dimension and continues to rack up Derby points. His versatility is a big weapon, along with his professionalism. Lightly raced and well-bred Tiz Shea D was 2nd and Classy Class crossed the line in 3rd. Comments: After back-to-back grueling efforts, he got a much needed easy wire job win in the San Felipe. Latest Published Workout: 6f from the gate in 1:10.40 (1/36) at Santa Anita on March 6. Comments: Foot bruise knocked him out of the G1 BC Juvenile. 2YO Champ returned to the work tab on Feb 2. The G2 Rebel at Oaklawn on Saturday is next. Comments: The former early-pressing type added a new closing weapon to his arsenal in the Gotham Stakes. Last Start: Close 2nd in G2 San Vicente on Feb 1. Comments: Used swimming therapy (through March 7) to help heal his foot abscess and is expected to return to the worktab at Santa Anita on March 14. It looks like one more Derby prep, probably the G1 Santa Anita Derby on April 4. If he needs an extra week, the G1 Arkansas Derby on April 11 is the backup plan. Comments: Crossed the line first in the FOY but did not look like the sharp Holy Bull winner. Latest Published Workout: 6f in 1:11.65 (1/4) at Palm Meadows on March 13. Comments: He competes next in the Florida Derby, Wood Memorial, or Blue Grass. Comments: A solid place finish in his Swale return should set him up nicely for an upcoming two turn Derby prep. Latest Published Workout: 5f in 1:00.80 (8/22) at Santa Anita on March 8. Comments: Gave undefeated Dortmund a big scare in the Los Al Futurity and Robert Lewis Stakes. Comments: Rapidly improving colt earned important Derby points in the San Felipe. Last year’s Grade 1 Breeders’ Futurity hero and BC Juvenile runner-up Carpe Diem begins his road to Kentucky Derby 2015 in Saturday’s Grade 2 Tampa Bay Derby. Carpe Diem is probably ready to roll off a layoff for Todd Pletcher but his Tampa Bay task will not be easy with Ocean Knight in the field. The latter is undefeated and smartly won the local Sam Davis from an outer post (wide trip). The Kiaran McLaughlin trainee has tactical speed and plenty of upside. In addition to the Tampa Bay race, Derby preps this week include Saturday’s G3 Gotham (Aqueduct), G2 San Felipe (Santa Anita Park), and G2 Swale Stakes (Gulfstream Park). The latter is a seven panel sprint and has no Derby points attached. Latest Published Workout: 4f in :49.57 (10/11) at Palm Beach Downs on Feb 28. Comments: He is entered in the Tampa Bay Derby on March 7. Latest Published Workout: 7f in 1:25.60 (1/1) at Santa Anita on Feb 26. Last Start: 1st in G3 Robert Lewis Stakes. Comments: The undefeated colt will run in the G2 San Felipe on March 7. Comments: Lecomte-Risen Star winner will probably return to Fair Grounds for the G2 LA Derby on March 28. Comments: Foot bruise knocked him out of the G1 BC Juvenile. 2YO Champ returned to the work tab on Feb 2. The G2 Rebel at Oaklawn on March 14 is a likely return spot. Latest Published Workout: 4f in :50.10 (41/118) at Belmont (dirt training track) on March 1. Last Start: 2nd in G3 Withers at Aqueduct on Feb 7. Comments: Won the pace battle but lost the war in the Withers. He never misses a dance and goes next in the G3 Gotham at Aqueduct on March 7. Comments: Using swimming therapy (through March 7) to help heal his foot abscess. It looks like one more Derby prep, probably the G1 Santa Anita Derby on April 4. If he needs an extra week, the G1 Arkansas Derby on April 11 is the backup plan. Latest Published Workout: 4f in :48.45 (8/33) at Palm Meadows on March 6. Comments: The runner-up in the Remsen & Holy Bull seemingly had the Fountain of Youth in the bag but spit the bit in the lane. Latest Published Workout: 4f in :49.51 (20/29) at Palm Beach Downs on March 2. Comments: He is the favorite for Saturday’s rescheduled G2 Swale Stakes at Gulfstream Park. Latest Published Workout: 4f in :49.95 (26/45) at Palm Meadows on Feb 28. Last Start: 1st in G3 Sam F. Davis. Comments: Connections decided against shipping to NY so the Tampa Bay Derby is next. Latest Published Workout: 4f in :50.20 (11/32) at Gulfstream Park West on Feb 21. Last Start: 1st in Texas Glitter (5f turf) at GP on Feb 7. Comments: Suddenly everything is going wrong for this one. The G2 Swale Stakes was cancelled last weekend, and he spiked a temperature and scratched out of the Tampa Bay Derby on March 7.